What does a photographer do on his day off ? The answer is simple – book a studio and take photographs! A few weeks ago I got together with a bunch of other photographers, booked a studio in central Manchester, booked a fab hair and make up artist, and asked the international model Jen Brook to come along and model for a couple of hours. I spend almost 90% of my working life out on location, whether that’s a wedding venue, a conference hall, offices, swinging high in the air above Salford Quays (see last week’s blog), or a million other places. But sometimes, I’m in a studio. It’s a place I love being because it’s an environment where I have 100% control over things. No weather to contend with, no traffic or passers-by getting in shots, no other distractions. Just the lights, the background and the subject. Of course, as well as ‘playing with some lights’ and spending time with friends, I wanted there to be a practical point to the shoot. So, I deliberately set out to make images using the same lighting set up I could take out on location with me (all of these images were shot with one light). Fashion and beauty photography is something I’ve done a little bit of, and something I’d like to pursue much more. The images here are all deliberately simple and classic. We (and it’s definitely ‘we’ – a shoot like this is always a collaborative effort) were aiming for a Fine Art feel, with a touch of elegance. 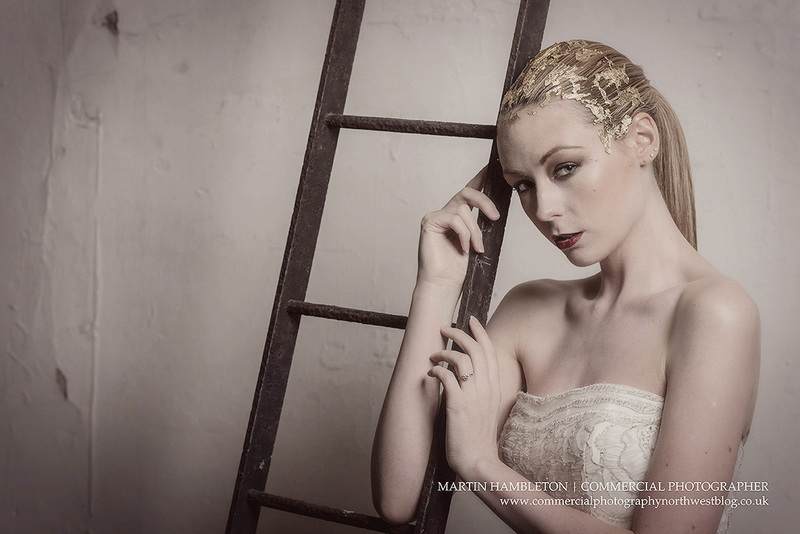 Zoe worked wonders with the ‘look’ – yes, that really is gold leaf in Jen’s hair! And Jen brought the poise that I’ve seen in so much of her previous work. None of the photographs is complicated, deliberately styled for simplicity but impact. It’s a look that I could create during a wedding without interrupting the flow of the day, for example. If you’re interested in discussing fashion or beauty photography, please get in touch via the contact form or give me a call on 07766 815703.